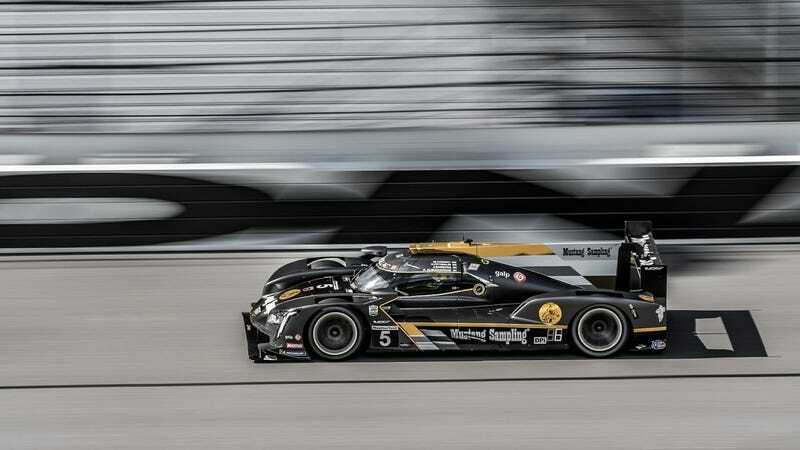 The #5 Mustang Sampling Cadillac DPi of Action Express Racing won the 2018 24 Hours of Daytona in a tight battle to the very end. This year, the team is facing adversity early on, as a spin broke the electrical connection to the rear lighting of the car. Cars are not able to race without tail lights, especially as the race runs through the night. The car is shared by Joao Barbosa, Fillipe Albuquerque, Mike Conway, and Christian Fittipaldi, who recently announced his retirement from the sport. The team attempted to affect repairs in the pit lane, but ultimately ended up wheeling the car back to the garage to get access to tools and more hands on deck. After quite a while in the garage, the team returned to the track 13 laps off the overall lead. With more than 20 hours remaining in the 24 hour race, there is still an opportunity for the team to make up that time. This race is such a nip and tuck battle from flag to flag that it will be unlikely to see the #5 take a repeat victory, but it ain’t over until it’s over.